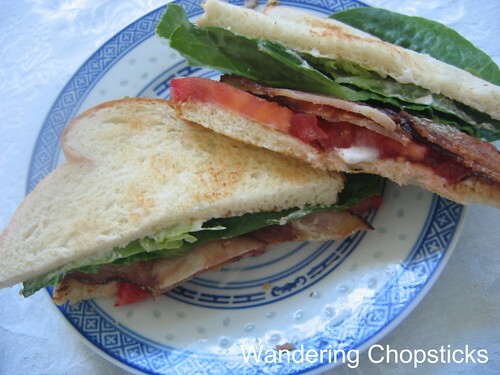 While a BLT (Bacon, Lettuce, and Tomato) sandwich is good at any time, it's especially good during the summer with fresh tomatoes off the vine. Take advantage of tomato season before it's completely gone. Lightly toast two slices of bread and set aside. Fry four slices of bacon in a pan. Remove the bacon slices and set on paper towels to absorb excess grease. Pour out most of the bacon grease, reserving a light coating in the bottom of the pan. Then lightly pan-fry one side of each slice of bread in the bacon grease. That's right. I said it. You're already getting plenty of fat with this sandwich, so I'm just adding to that. Fat = flavor. So fry one side of each slice of bread in that bacon fat. Then slightly schmear mayonnaise on each slice of bread. Add bacon, lettuce, and tomato slices. 1 year ago today, Sinh To Nha Dam (Vietnamese Aloe Vera Shake). I like to add sliced avocado. And a fried egg with runny yolk if I'm feeling really decadent.